This week’s installment of Let’s Make Something Together has us playing with a variety of media to create darling wall hangings for a special little someone in your life! Having just moved into our new home, our walls are still very bare for the most part. So, when the weekly challenge over at So You Think You’re Crafty was based on the theme Wall Decor, I jumped at the opportunity to adorn the naked walls in my youngest daughter’s nursery! When dreaming up the look I wanted to achieve with these, I came across these personalized animal wall hangings at Pottery Barn Kids. I loved the look of these, but not the price tag. (Isn’t that how it always works?) So, I opted to create some of my own, using the same initial/animal theme. 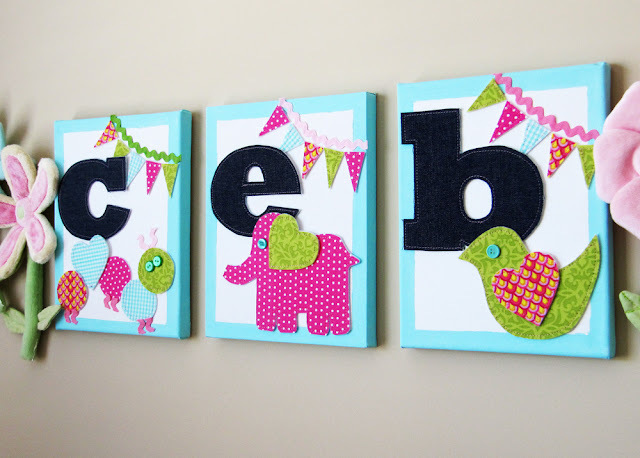 Each of the wall hangings is personalized with Baby’s initials in bold denim and a corresponding animal shape for each letter. To really take this project to the next level, I adhered my fabrics to a special interfacing called Peltex to create an abundance of dimension. Machine stitching imparts a homespun feel to these wall hangings, while the variety of vibrant fabrics and whimsical animal shapes is entirely fresh and modern. The dynamic color palette and variety of shapes incorporated into these little works of art are sure to captivate Baby’s interest, too! Interested to see how I put these darlings together? Let’s get to it! 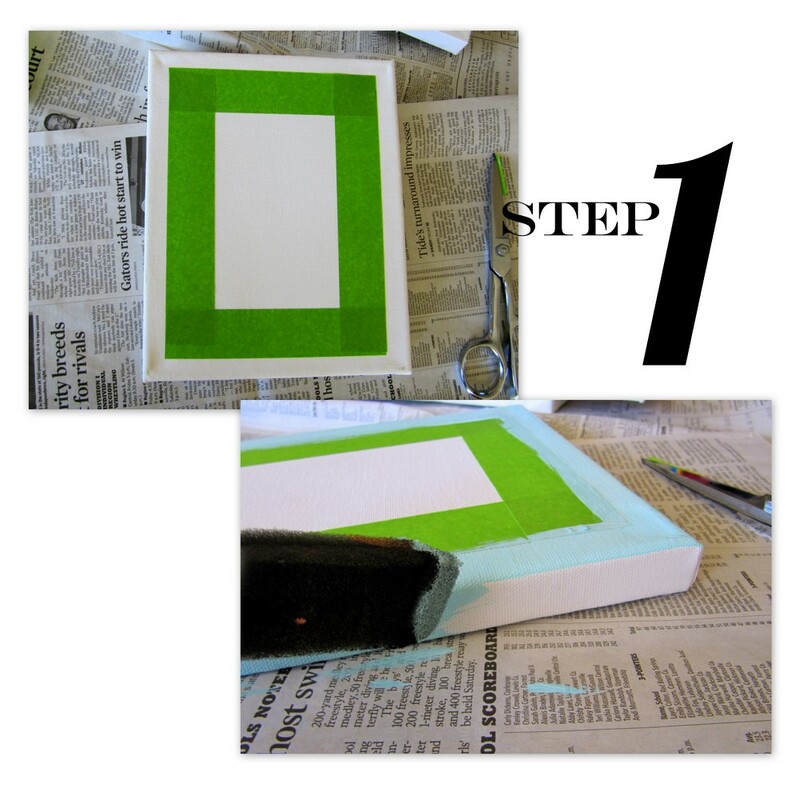 step 1 / Apply a frame of your painter’s tape to your blank canvases about 3/4″ from the outer edge of each, as shown. Use your foam brush to apply acrylic paint to this blank outer frame you created, both on the front and sides of the canvas. Allow paint to dry completely before removing your tape. step 2 / Fuse Peltex to the back of your fabric pieces according to the product instructions. Using your word processing software, create tracing templates for each of Baby’s initials. (I used Rockwell Extra Bold at 550 pixels.) Cut out your templates, then use your washable marker to trace them in reverse onto the back of your fused fabric piece. Cut out your letters, and then machine stitch around the edge of each with your machine outfitted with your jeans needle, if desired. For the animal shapes, create templates by hand, or find some images you like on the web. (See my notes below for things to keep in mind when creating your templates.) 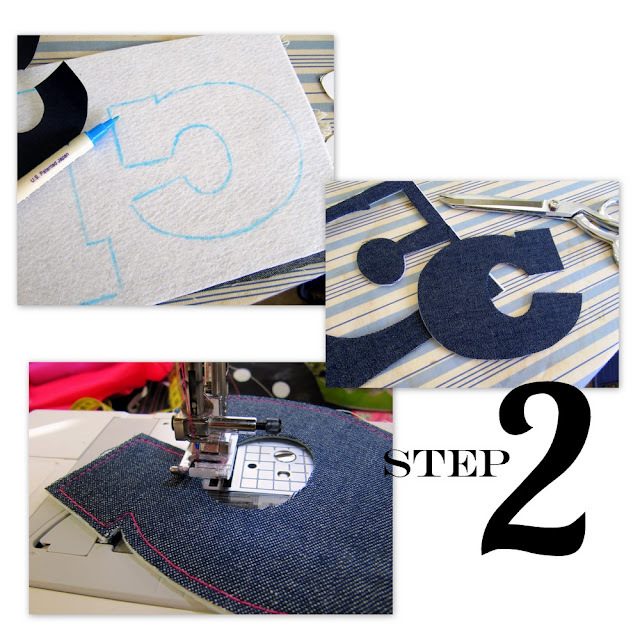 Cut these templates out, and trace them onto the back of your fused fabrics, just as you did for the initials. Be sure to mix and match your fabrics to give your wall hangings a vibrant, whimsical feel. Cut out each of the shapes, and stitch around these as well (optional). From the scraps of fused fabric you have remaining, cut various triangle shapes, approximately 5 for each canvas, depending on the size of your triangles. These will be used to form a pennant banner at the corner of each of your wall hangings. Peltex is a very heavy-weight interfacing often used in place of cardboard or other materials to add stability to the base of handbags or totes. This really is a key ingredient to these canvases, as the dimension it imparts takes everything to the next level. You can find it where the rest of the interfacings are located in your sewing supply store. Because of the personalized nature of these, I was unable to provide animal templates for each of the 26 letters of the alphabet. 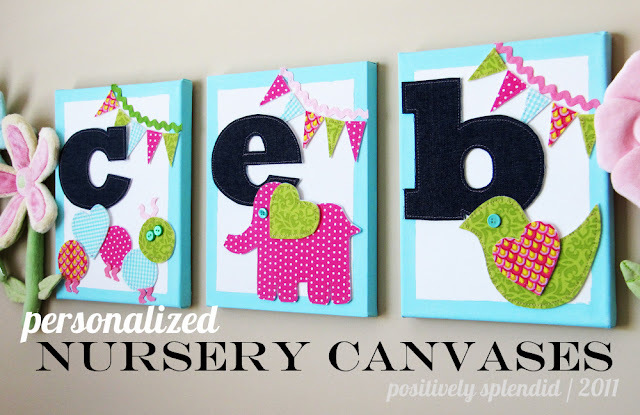 However, if your baby’s name happens to include any of the letters in my hangings above, you can download those animal templates here. When formulating your animal templates, keep the shapes involved as simple as possible. Refer to my animal shapes above, which include basic shapes like hearts, circles, etc. Bear in mind that the more intricate the design you choose, the more tedious your work will become! These are lovely, I really need to do something similar to jazz up my little boys rooms, thanks for the inspiration! These are over the top adorable! They are just so CUTE! I adore everything about this!!! Great job! we are having a giveaway this week on my blog… check it out if you like! This is SO cute! I love the bright colors and the hidden hearts on each animal. Definitely an eye grabber for baby!! These are amazing! Man, I wish I was having another baby just to make some of these! Thanks for sharing! Oh my gosh, SO cute!! And did you notice how they match your blog colors? I just love this project – thank you for sharing with us!! These are so darling! I love every little element…the denim, the pennants, the cute little critters! So charming! These are SO amazing!! I love everything about them, including your photos!! These are so cute! I love the mix of fabrics and the fun penants with the rick rack! These are absolutely adorable!! Love the fun, bright colors . These are perfect. I love them. The colors are so bright and cheery. Awesome job! OH my goodness! Amy these are so incredibly cute! At first, I wondered if you were doing an ABC kind of thing, but I love that you used her initials!! It’s so whimsical, fun, bright, and happy–perfect wall decor for a nursery! And those pennants are darling! Way to go! These are darling, Amy! So cute. I love the all the dimension with the layers and the stitching. So cute! Love this idea!! Too much cuteness! I’m a new follower and would love it if you had a chance to check out my newbie blog sometime! Me perdoe, não sei inglês, mas você é super criativa, amo suas sugestões e agradeço por compartilhar idéias tão belas. Love these and great tutorial!! Have to share on my FB page! Love it , love you, stumbled it. These are adorable! You could do so many variations. This post is definitely going into my inspiration files! Love this! Thanks for the detailed tutorial! These are so adorable! I’ve been looking for a cute way to post the Alphabet in my daughter’s room and now I think I’ve found it! Thanks so much for sharing this! So fun! I love all the different elements together, it just works! And the elephant is adorable, ps. i can’t take the cuteness!!!! of course, i think you know i have a thing for some bunting on EVERYTHING!!! Too darn cute and your workmanship is beautiful. Job well done. So cute!! I love the colors! I would be thrilled if you stopped by my Commercial Break Thursday at http://www.suzyssitcom.com and linked this project! Very well done, and nice and bright and cheerful. I think the buntings are what make it sheer perfection. Love! These are amazing – thanks for the great tips! These are so cute! I love the modern styling. Your color choices look great! 🙂 Nice job. These are so darling!!! They are seriously some of the cutest nursery art I’ve ever seen. I love the fabrics and colors! Found you @ the linky party @ TT&J and I’m a new subscriber! OMG! Those are adorable. What an inspiring post. I absolutely love the little bird and elephant. I’m your newest follower. It would be great if you could stop by my blog Monday and add your project to The More The Merrier Link Party. Wow! How adorable! I’m so glad to have found your blog! SO SO cute! Love your blog. I hope you’ll link it up at I Heart Nap Time. 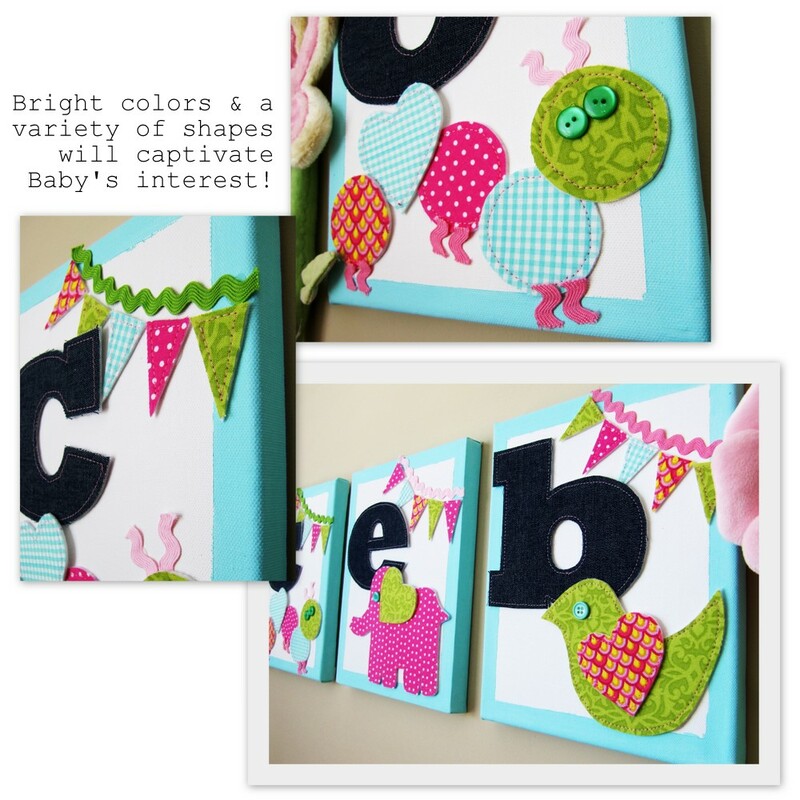 I LOVE these… will definitely be referring back to this tutorial when I have my next baby! I actually featured it today on my blog, http://www.nestingtime.blogspot.com. Thanks for sharing your creative talents! These are FABULOUS!! You did an amazing job on them. Thanks for sharing! My brother and sister in law are having a baby in october… looks like i know what i will be making them! thanks for the idea! Those are so beautiful! I love them! You are one crafty lady!!! 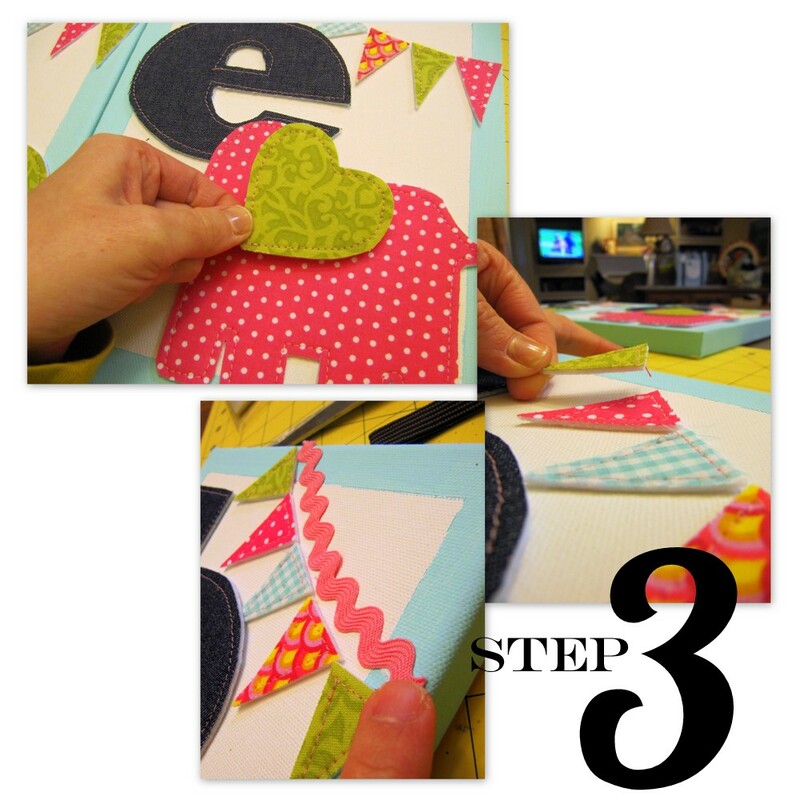 I have featured this project on my blog today and I would love for you to stop by! I almost didn’t leave a comment because you have so many,but I had to tell you that these are fantastic! Oh you can’t even imagine how thrilled I was to come across this post! 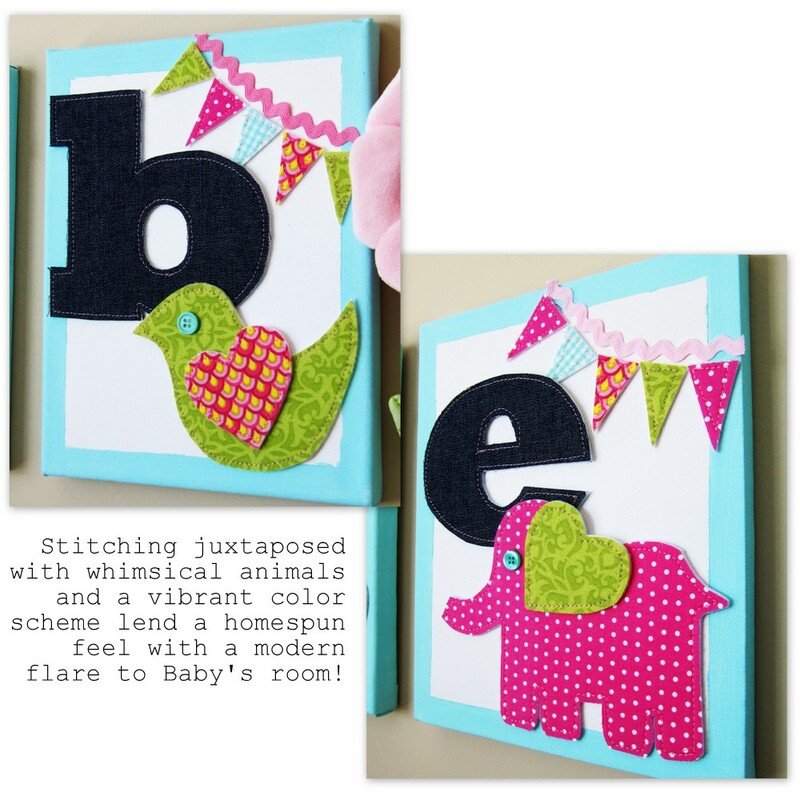 I am using E is for Elephant theme in her nursery and to have the elephant pattern has literally made my month!!! Thank you so much! I think yours are WAY cuter than the ones you got the inspiration from!